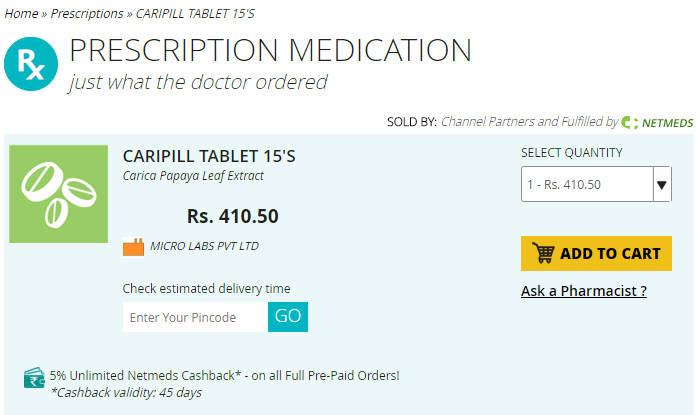 Caripill Carica Medicine Free Tablets Cure Dengue 48 hours 2 days - ayupp.com - which gives details about the Dengue cure. It gives clear information about how dengue can be cured using this leaves. This tablet is also popular in countries like Malaysia and Indonesia, where Dengue cases are very frequent. Mirco Labs started marketing for this product in July 2015 and by September 2015, it had already sold 2 lakh units. These details can be verified by Business Standard. It is not available for free. If you buy it online then 15 tablets are available at 410.50. I tried calling on the numbers mentioned in the viral message, none of the numbers were available. Confirmation by Ayupp.com – Partially True. Ayupp Analysis – This is most popular medicine sold in market for cure of Dengue. As it contains extracts of Papaya which is helpful in platelets creation in the body. US National Library of Medicine has also published one report regarding this information. One of the researchers has published article for the same - https://www.ncbi.nlm.nih.gov/pmc/articles/PMC3614241/ - which gives details about the Dengue cure. It gives clear information about how dengue can be cured using this leaves. The viral message also claims that it can cure Dengue in 48 hours. Dengue is basically caused due to bite of mosquito which infects blood stream and platelets start to decrease drastically. In many cases patients cannot survive. And in most of the cases, blood has to be supplied directly in the infected person. So, if someone claims that he has got cure for dengue in 48 hours, this is not correct.